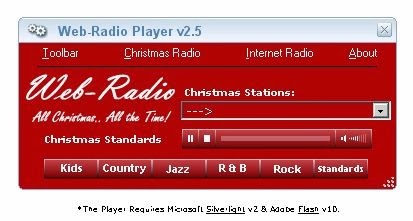 This site has all the Christmas Web Radio you could ever need. There are so many I can not even begin to count them. You can get the widget if you wish. I scrolled down to the red player & picked my genre of choice then clicked play. Once I clicked on it there was a player that poped up in a small window that I clicked the minus button to minimize the player. Now you can browse the internet & listen to Christmas radio at the same time. You can also scroll further down & pick Windows Media Player and clicked on live. Some of them will take you to a new page I just used my back button if it wasn't the one I wanted to listen to. If you click the player & don't want to listen to that station just click the X to close a pop up window.